Voltaire was a French writer famous for his wit and irony. They were his tools for launching vitriolic attacks on the established Catholic church, the adversaries of freedom of religion and expression, and on separation of church and state. His prolific writing took almost every possible literary form: plays, novels, essays, but also poems, historical and scientific works. 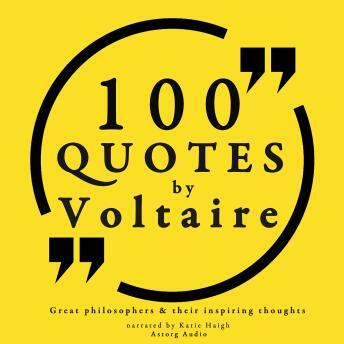 We have selected for you 100 of his most fascinating quotes, for you to get acquainted with the philosophy of the Enlightenment, appreciate Voltaire's talent in writing. Delve into the most important ideas of the author of Candide, Zadig, the Dictionnaire philosophique (Philosophical Dictionary), or the Letters on the English.